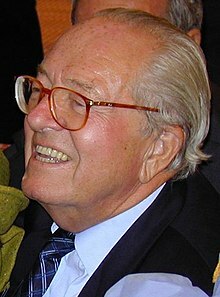 Jean-Marie Le Pen (born 20 June 1928) is a French politician and the founder and former president of the Front National political party. There must be an authority, and we believe that the most qualified authority in a household is the man's. I am not saying that gas chambers did not exist. I did not see them myself. I haven't studied the questions specially. But I believe it is a minor point in the history of the Second World War. We must tell the Algerians that it is not the case that they need France, but that France needs them. They are not a burden, and if they are for now, they will on the contrary be a dynamic part as well as the young blood of the French nation into which we will have integrated them. I claim that in the Muslim religion there is nothing, in the moral point of view, that would be incompatible with making a believing or practicing Muslim a full French citizen. Very much on the contrary, its basic principles are the same as for Christianity, which is the basis of Western civilization. On the other hand, I do not believe that there exists an Algerian race, any more than there exists a French race … I conclude: let us offer to Algerian Muslims entrance and integration in a dynamic France. Instead of telling them as we do now: "you are very expensive, you are a burden", let us tell them: "we need you, you are the youth of the nation." As quoted in Journal officiel de la République française (28 January 1958); said when Algeria was still a part of Metropolitan France before it attained independence. The sidaïques, by breathing the virus through all their pores, put into question the equilibrium of the nation... The sidaïque is contagious by his sweat, his saliva, his contact. It's a kind of leper. Everyone sees drama from his own perspective. My father was killed by a German mine, while I lost other relatives in Allied bombing attacks. The Second World War claimed tens of millions of victims. For some the most terrible aspect of it was the deportations, while for others it was the leveling bombings or the mass deaths by starvation and cold. In the wake of Jean-Marie Le Pen's capture of 17 percent of the vote in the first round of France's presidential election, the French Establishment, too, has shown great tolerance for fascist tactics in resisting any rebirth of the European Right. … Though Le Pen has made radical and foolish statements, there is no evidence he is a Nazi. His hero is not Hitler but Joan of Arc, and he and his National Front have accepted defeat in every election they have lost. No, Le Pen is hated and feared not just for who he is, but for the issues he has raised. … As it is often the criminal himself who is first to cry, "Thief!" so it is usually those who scream, "Fascist!" loudest who are the quickest to resort to anti-democratic tactics. Today, the greatest threat to the freedom and independence of the nations of Europe comes not from Le Pen and that 17 percent of French men and women who voted for him. It comes from an intolerant European Establishment that will accept no rollback of its powers or privileges, nor any reversal of policies it deems "progressive." My last infamous subject was the extreme right wing French politician Jean-Marie Le Pen. Even when I am not in sympathy with the person, I have to be in love with him or her while I'm doing their portrait. Le Pen adored me (at least until his photo ran alongside Hitler's in Le Monde), and we got on extremely well. Helmut Newton, as quoted in Photo (2005) by Graphis Inc. This page was last edited on 27 April 2015, at 18:42.